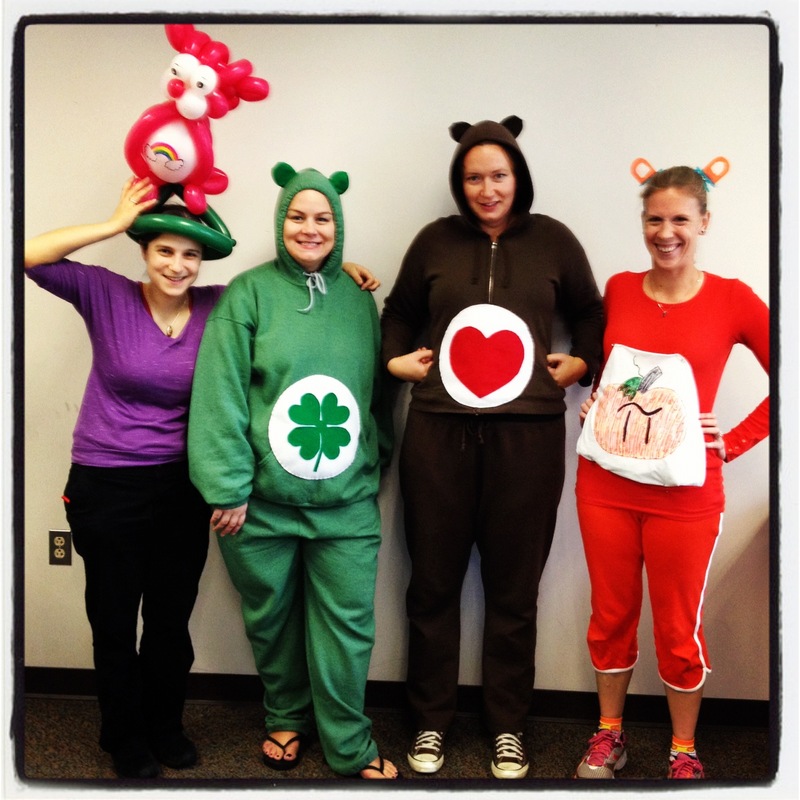 Happy Halloween from some Care Bears (and Innovation Academy teachers)! I can’t take credit for coming up with the idea for this year’s costume theme on the Community Membership team, but I would like to take this opportunity to remind you to be thoughtful as you venture out trick or treating. In honor of the Care Bears, here’s a reminder that being CAREFUL of safety is important, but it’s equally important to be CARING. All costumes are meant to be fun, but some end up being hurtful. 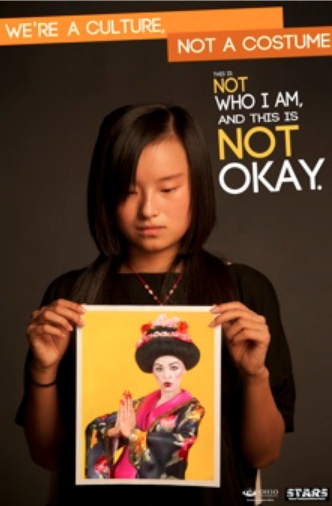 Sometimes costumes make fun of other cultures and can actually make people feel really bad. 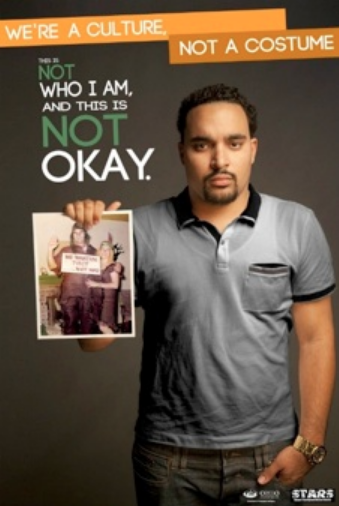 Students at Ohio University came up with a powerful poster campaign to spread their anti-racism message. Check out their powerful message, and think of these as reminders to be thoughtful. 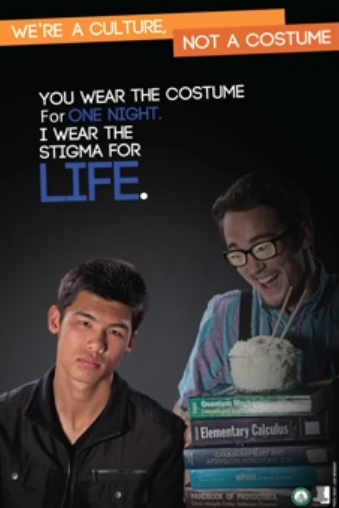 They’re not meant to take away any fun from the holiday, but hopefully they make you think about what messages your costumes can give to others. Do costumes like this make people think that all Native Americans wear feathers and dance around banging drums all day? Does dressing like this make us laugh or do we respect the beauty of these traditions? What do we have to learn from taking time to understand other cultural dress, such as this one showing a Japanese geisha? Not all Asian people are nerdy. Can you imagine living every day with people making assumptions about you because of your race? Some people see a Middle Eastern person and automatically assume he might be a terrorist. That’s not surprising when we see images like this one in the media very often. We need to change these stereotypes, not reinforce them. What do these costumes have in common? They all show a stereotype of a culture that is common in another country but is a minority in the United States. They can all be very painful for people from those groups. 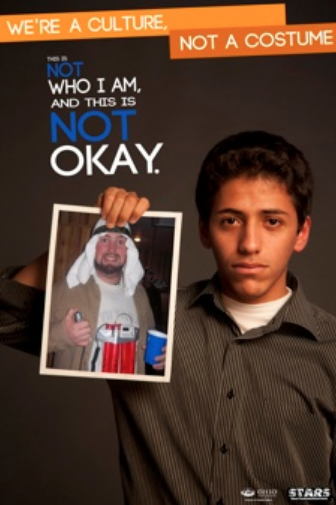 Sadly, the person wearing the costume might not have any idea of how it could be perceived by others. So, if you see someone with a costume that makes fun of another culture, use it as an opportunity for conversation and reflection. The first step towards change is caring. Now’s that’s a great theme for Halloween. I think this is a cool post! I am Asian and I am NOT nerdy! I am just smart!!!!! Happy Halloween! 🙂 Have a good one! It’s funny how you all dressed as Care Bears! Was it Ms. Anderson or Ms. McCaffrey that came up with the idea? And I agree that we shouldn’t make fun of other people’s cultures. Also, I’m Asian, and I’m not a nerd! I’m just a smart person. I hope no one felt insulted this Halloween. But Happy late Halloween anyways!! You guys had great costumes! I’m sorry I didn’t get my pix to you in time for your Halloween blog. I also didn’t see Mrs. Fallon’s awesome Apple Pi bear. So great! This poster campaign is thoughtful and amazing. I do find an interesting difference in the message of some of the posters, though. In each of the first posters, there really were people in history who dressed or had traditions involving those costumes. They can be lovely, interesting historical costumes if you wear them correctly and respectfully, for Halloween or other dress-up opportunities. I can see why the cultures involved could take offense, and rightly so. But it doesn’t have to be that way. The “nerdy Asian” costume is out of context; you can be a “nerdy Anyone” for Halloween and it’s up to you to decide whether you’re making fun of someone else, culture or otherwise. I’m definitely nerdy and always have been; it’s a very easy back-up costume and fun to poke fun of oneself. I’ve never seen anyone dress as a nerd of another culture; I’m sorry if this happens. It just seems pretty lightweight as a poster compared to the others. 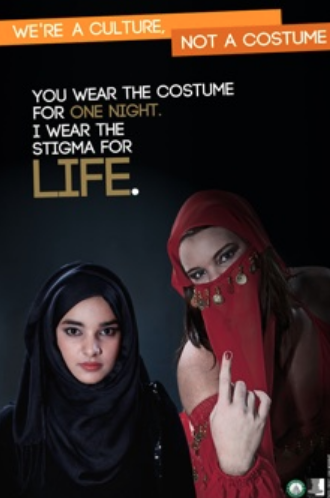 As far as harmful stereotypes, the last poster is the one that does it for me. This is a symptom of hate and fear of other cultures that has been around in one form or another for millennia, but was most forcibly injected into our generations by 9/11. The terrible act of a small group has caused so many to turn on a whole culture, and that fear and hate has been perpetuated by the media, politicians, and the small-minded. The boy in the poster has a right to look sad and scared; if this is what people think all males of his nationality and religion are like, he’ll grow up fearing for his life. I really liked the religion study in your class last year, because it helped the kids see that people who worship and dress differently aren’t necessarily crazy, weird or dangerous, but can be so similar to us in many key ways. And the ways that people are different can be so interesting and fun to learn about. I think it’s great you put this campaign up on your blog for kids and parents to have something to think about.